OSU, Log House Plants create new line of purple veggies packed with whole new levels of antioxidants, anthocyanins and the like. Incorporating fruits and vegetables in a range of colors into your daily diet is an excellent way to boost nutrition and enjoy some great flavors. Depending on time of year, it’s pretty easy to put green, orange or red foods on a plate. But what about purple? Other than blueberries, eggplant and the occasional purple potato, most people haven’t seen a lot of choices for violet-hued foods. This spring, Log House Plants, a wholesale nursery in Cottage Grove, is introducing Log House Plants/SuperNaturals Grafted Vegetables, LLC as part of its Purple Power campaign. At the center is something that will look different to even the savviest consumer: purple tomatoes from the brand-new and trademarked Indigo line of plants developed at Oregon State University and distributed exclusively through Log House Plants. Alice Doyle flips past photo after photo of stunning purple vegetables in her SuperNaturals line: Violetto Purple artichokes. Red Ball Brussels sprouts. Even Double Red corn, the world’s first all-purple sweet corn, which owes its name to crimson husks surrounding rows of dusky kernels. Doyle, who founded and owns wholesale Log House Plants with partner Greg Lee, is pushing purple plants because of their outstanding health benefits. Purple and blue foods are rich in anthocyanins, which bestow health benefits such as lower cholesterol, increased blood flow to the eyes, and protecting blood vessels and certain types of tissues. “It’s like the fruit is waving a flag that says, ‘Eat me! I’m really good for you,’” Doyle exclaims. 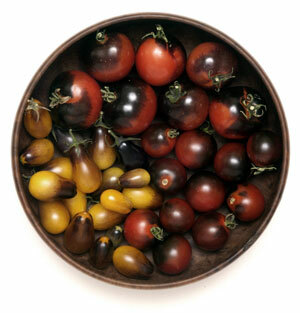 The highlight of the collection is the Indigo line of tomatoes. The fruit has been billed as the world’s healthiest because it has concentrations of antioxidants (such as anthocyanins) and phytonutrients (including flavonoids) up to four times higher than standard tomato varieties. Myers developed the Indigo line from wild specimens he collected and banked at University of California-Davis. He crossed the samples with cultivated varieties to see if higher nutrition values could be restored. He found that combining traits from two particular types of tomatoes — one from Chile, one from the Galapagos Islands — yielded the highest concentrations of anthocyanins in his new plants. He used conventional breeding techniques, not genetic engineering, to develop the tomatoes. His first result was called ‘Indigo Rose.’ It was followed closely by ‘Indigo Cherry Drops’ (PVPAP) and ‘Indigo Pear Drops’ (PVPAP). Each fruit starts out an inky shade of purple and gradually takes on a red or yellow hue, depending on the variety. They are ripe when streaks of purple remain only on the shoulders, which takes about 90 days for ‘Indigo Rose’ and 70 days for the other varieties. Doyle cautions gardeners not to give in to temptation and pick the purple veggie varieties early. Part of the inspiration for Doyle’s Purple Power campaign came from the book, “Eating on the Wild Side: The Missing Link to Optimum Health” (Little, Brown and Company). Author Jo Robinson discusses how cultivation causes plants to lose much of their nutrient value over time. She combed scientific data to determine the healthiest varieties of more than a hundred different fruits and vegetables, then created charts for consumers on how to purchase and prepare their food for maximum benefit. Writer Sophia Bennett can be contacted at hg@registerguard.com. plants.com for outlets in the area and beyond.